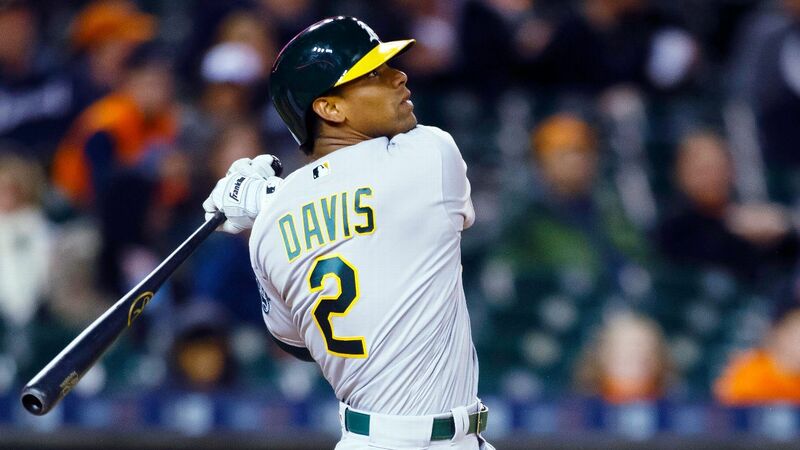 OAKLAND, Calif. --Athleticsslugger Khris Davis is getting a $6 million raise after leading the majors in home runs last season. The A's also agreed Friday to one-year deals with left-hander Sean Manaea for $3.15 million, second baseman Jurickson Profar for $3.6 million, shortstop Marcus Semien for $5.9 million and outfielder Mark Canha for $2.05 million. Davis received a hefty raise from the A's last winter, then went out and hit a majors-best 48 home runs while setting a career high with 123 RBIs -- not to mention leading the low-budget club back to the playoffs for the first time since 2014 before a wild-card loss to the Yankees. Before the 2017 season, Davis defeated the A's in an arbitration hearing -- awarded a $5 million salary over the $4.65 million offered by Oakland. He had earned $524,500 in 2016 and that was his first time being eligible for arbitration. The A's acquired Profar from Texas in a trade last month, and he will become the regular second baseman to replace Jed Lowrie, who landed with the Yankees on Thursday for $20 million over two years. Semien matched his career high playing 159 games -- with 158 starts just like 2016 -- for the second time in three seasons. He batted .255 with 15 home runs and 70 RBIs while committing 20 errors. Semien worked with former infield coach Ron Washington to improve his defense after making a majors-high 35 errors in 2015, his first year with the A's.